The Aurora Branch was renown among the other units of the Chicago Stake for paying its stake building fund and stake welfare assessments in full and on time. How did a handful of members do what wealthier, more populous wards could not manage? They knew how to raise soybeans! 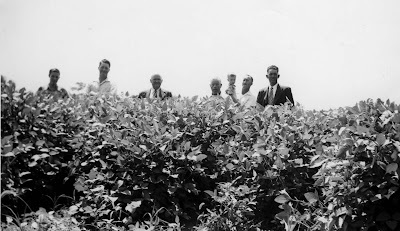 Men out standing in their field (of soybeans), in the early 1950s: John Earle, Rueben Earle, James T. Greer, August Kramer, Edmund Kramer holding Auggie, Robert L. Erekson. The Kramers and the Earles had their own farms south and west of Aurora. Bob was raised on a farm. They all knew what they were doing. Beyond that, James T. Greer was a farmer at heart, and he was determined to make it happen. And the amounts of the annual assessments were staggering. 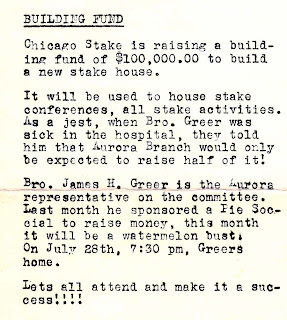 In July 1951 the branch newsletter reported that the Chicago Stake set a goal of raising $100,000 to build the stake center in Wilmette. We don’t know how much Aurora Branch had to raise, but it was, thankfully, less than $50,000. And everyone pitched in with pie socials, watermelon busts, and long days hoeing soybeans. The members cleaned out the weeds that grew too close to the beans for Jim Greer’s cultivator to take out. Here, hoes in hand, are Bob Erekson, Ginger Erekson, Rosalie Resch, Vera Resch, Rose Marie Resch, Erek Erekson (front), Myrtle Greer, Jim Greer. The entire branch felt ownership in these soybeans that grew so tall. 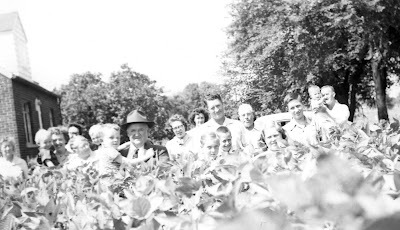 Gathered at the field (early 1950s) are Myrtle Greer, Iris Dombrow holding Mark, Louise Erekson (in back), Grace W. Erekson holding Erek Erekson, James T. Greer holding Tom Erekson, Mary Jane Greer, Dorothy Kramer (in back), Reuben Earle, Ginger Erekson and Donny Earle (in front), August Kramer, Phyllis Earle, John Earle, Edmund Kramer holding Auggie Kramer. 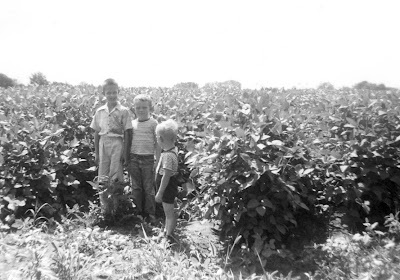 Donny Earle, Tommy and Erek Erekson, measuring themselves by the height of the soybeans, ca. 1952-1953. In her book The Story of Jim and Myrtle Greer: Family and Church, Myrtle Greer continues: “Jim would come into Chicago Stake meetings, and President Edmunds would ask who all’s got your assessment paid. Of all those people, none of them had their assessment, but when it come to Jim Greer, Jim just handed him a check, paid in full. Jim done it all from farming” (63-64). 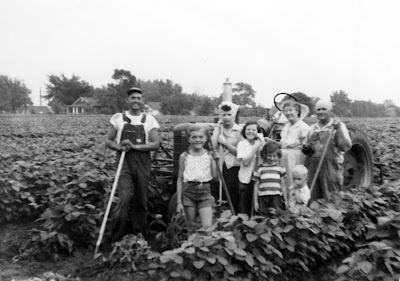 The soybean success story was repeated throughout the 1950s. In 1957, Myrtle noted that the soybean profit that year was $444.43. Simply put: “We worked hard. Soybeans is what we raised and sold for the church” (64). That is a great story! Reminds me of raspberry fields growing up...I love that the branch was the only one that paid up.